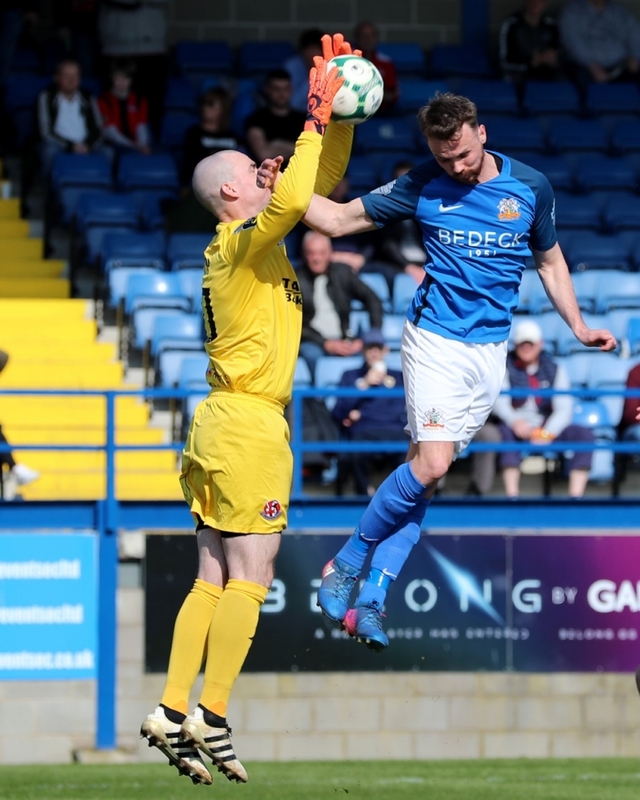 Glenavon scored two late goals to complete a dramatic comeback victory over Crusaders at Mourneview Park on Saturday afternoon. 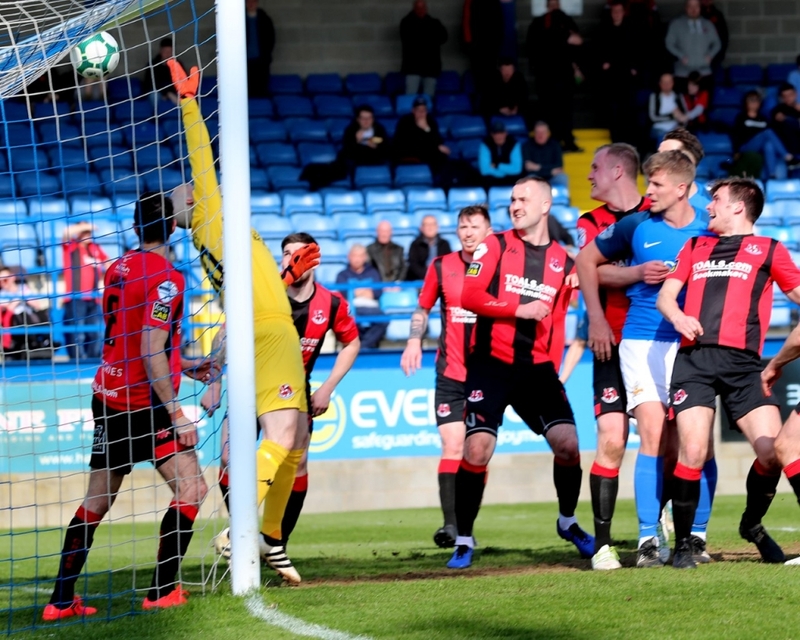 Jordan Owens opened the scoring for the Crues with a trademark header in the second minute of the second half, and as the game entered its final few minutes it looked certain that Owens’ goal would prove to be the winner. Instead, the introduction of player-manager Gary Hamilton turned out to be the catalyst for the Lurgan Blues’ late turnaround. The veteran striker set up fellow substitute Stephen Murray for the equaliser in the 90th minute before taking the corner-kick which resulted in a penalty being awarded for a handball by Rory Hale. 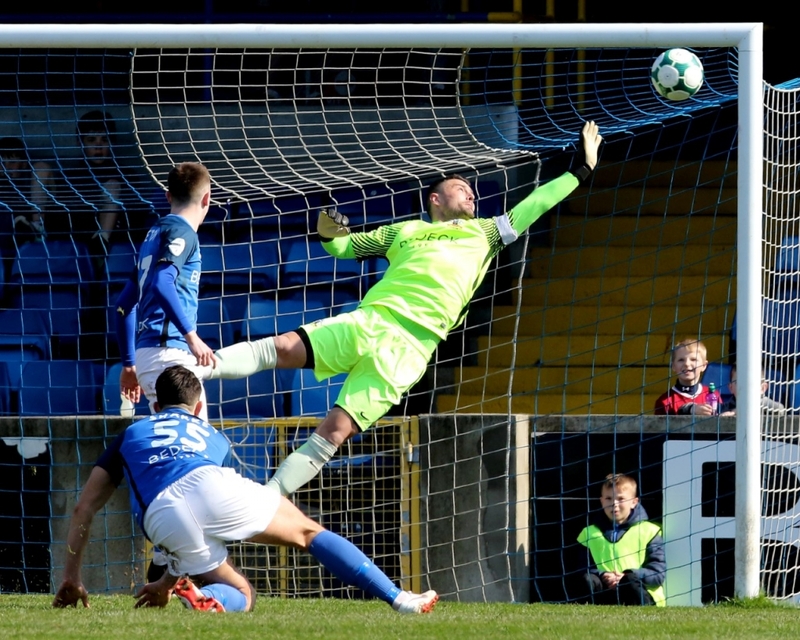 Sammy Clingan, who was only brought into the starting line-up when Andrew Mitchell got injured during the warm-up, calmly converted the spot-kick in typical fashion in the fourth minute of time added on to seal a 2 – 1 victory which sees Glenavon close to within just one point of the Crues. Crusaders’ Paul Heatley was in menacing form in the early stages of the game. James Singleton did well to get a block in to deny Heatley in the fifth minute, while the diminutive forward was involved again two minutes later in the passage of play which led to Gary Thompson getting a shot in which was destined for the top corner until Jonathan Tuffey dived to his left to make an excellent save. Jonathan Tuffey makes an excellent save to deny Gary Thompson in the early stages of the game. Photo by Maynard Collins. In the eighth minute Heatley picked out Owens with a cross, but the big striker uncharacteristically failed to hit the target with his header. Left-back Michael Ruddy then found Owens with a superb long diagonal ball. The striker brought the ball under control well, but he could only send his shot over the bar. The home side came into the game around the 15-minute mark, with Andrew Hall whipping a dangerous cross into the box before Josh Daniels cut in from the left a minute later and set up Robert Garrett. The midfielder’s well-struck shot had to be tipped over the bar by Gerard Doherty. Heatley shot over with his left foot on 25 minutes, while two minutes later he shot straight at Tuffey after the ball had been fed out to him on the left flank by Philip Lowry. Clingan had a pop at goal with a free-kick from 30 yards ten minutes before the break, but there wasn’t enough power in the shot and Doherty made a comfortable save. 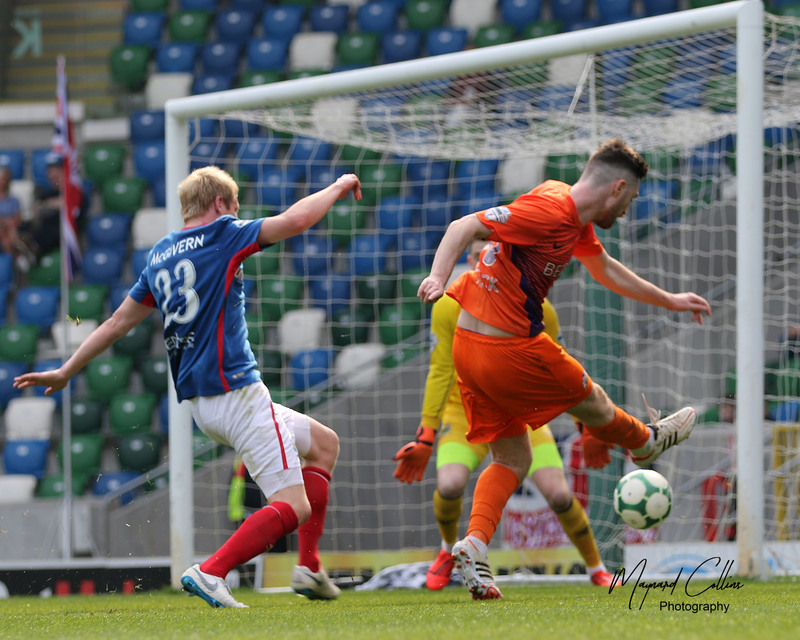 Glenavon came closest to breaking the deadlock in the first half five minutes later when Rhys Marshall rose to meet a Hall corner at the near post. It looked certain that the full-back was going to score, but his header came off the underside of the bar and landed right on the goal-line before Ruddy hooked the ball clear. Rhys Marshall goes agonisingly close to breaking the deadlock near the end of the first half. Photo by Maynard Collins. Tuffey made another fantastic save in the opening minute of the second period. Heatley was clean through and attempted to dink the ball over the onrushing goalkeeper, but Tuffey managed to get a hand to it. Ross Clarke followed up, but he sent his shot harmlessly wide. It wasn’t to be long before the Crues grabbed the lead anyway. Just a minute later Ronan Hale picked out Owens with an inch-perfect chipped ball into the box. The striker directed his header beyond the dive of Tuffey and into the far corner to make it 1 – 0 to the visitors. Glenavon tried to respond on 55 minutes when Aaron Harmon swung over a cross from the left flank, but it went just beyond Hall. 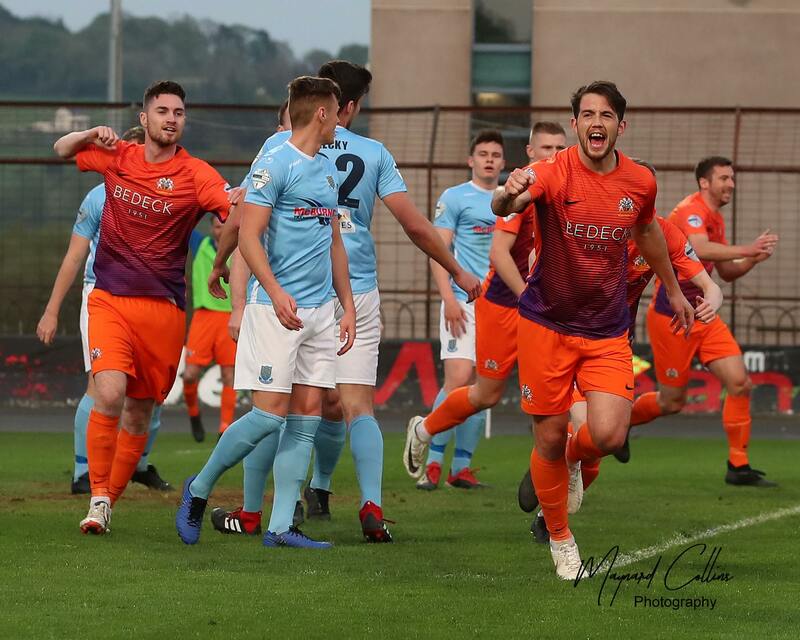 Tuffey made another save in the 64th minute when he kept out a Rory Hale free-kick, while Heatley flashed a volley wide of the far post three minutes later. Andrew Hall jumps to challenge for the ball with Crusaders goalkeeper Gerard Doherty. Photo by Maynard Collins. Substitute Jordan Jenkins was quickly involved in the action when he skinned Kyle Owens on the left wing before sending a low cross into the box. Doherty did well to cut the ball out. When Hamilton came off the bench there was just three minutes of normal time remaining, and much of the Mourneview faithful probably believed too little time remained on the clock for the player-manager to have much of an impact. How wrong they were. Hamilton’s introduction injected an impetus that had been lacking from his side’s performance up until that point, and in the 90th minute he combined with Murray to create the equaliser. Harmon picked Murray out on the edge of the Crusaders penalty area and the striker chested the ball down to Hamilton, who immediately played it back to him, releasing him into the penalty area. Murray’s low left-footed shot beat Doherty and found the net to draw the Lurgan Blues level. 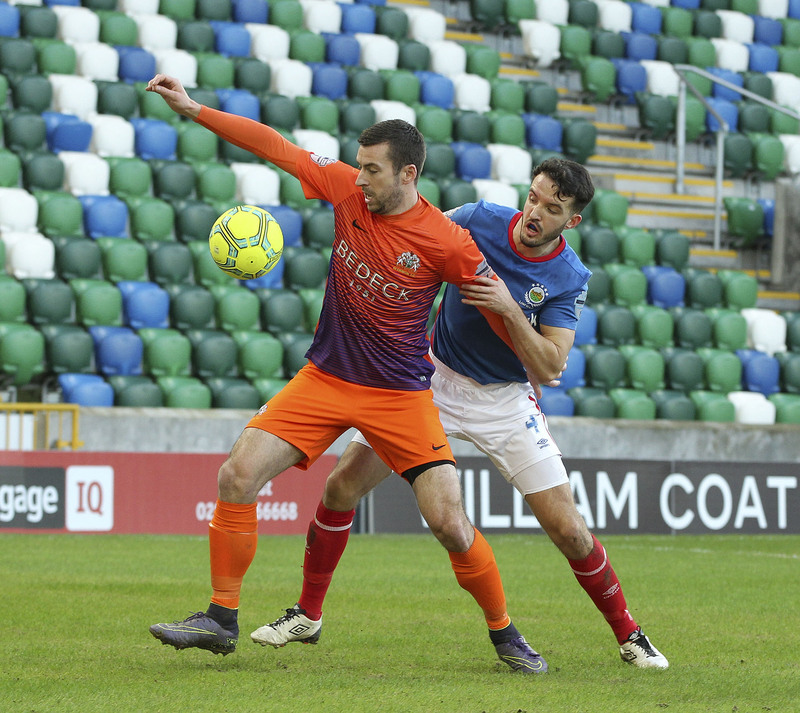 Glenavon weren’t done yet, however. 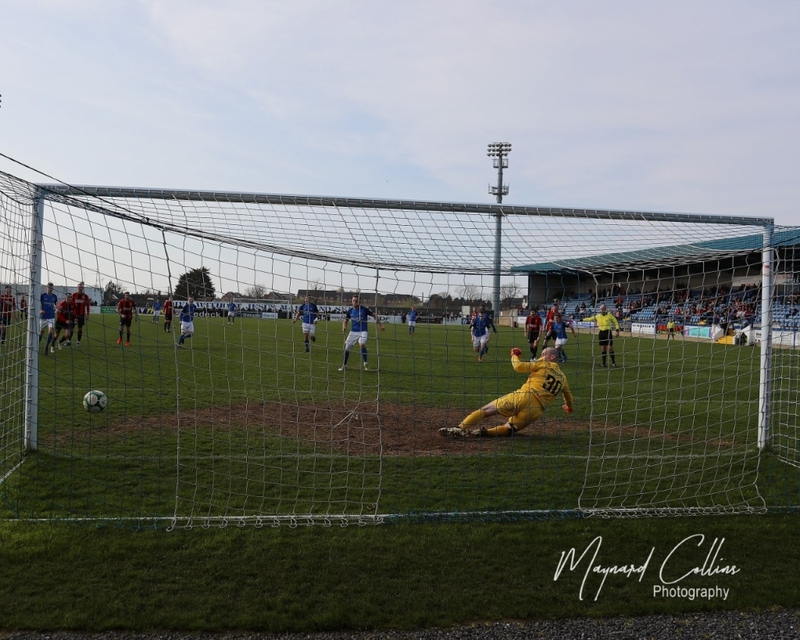 A corner-kick was awarded in the third minute of stoppage time and when Hamilton delivered the ball from the right it struck the arm of substitute Ronan Hale. Referee Steven Gregg decided that the incident warranted a penalty and he pointed to the spot. 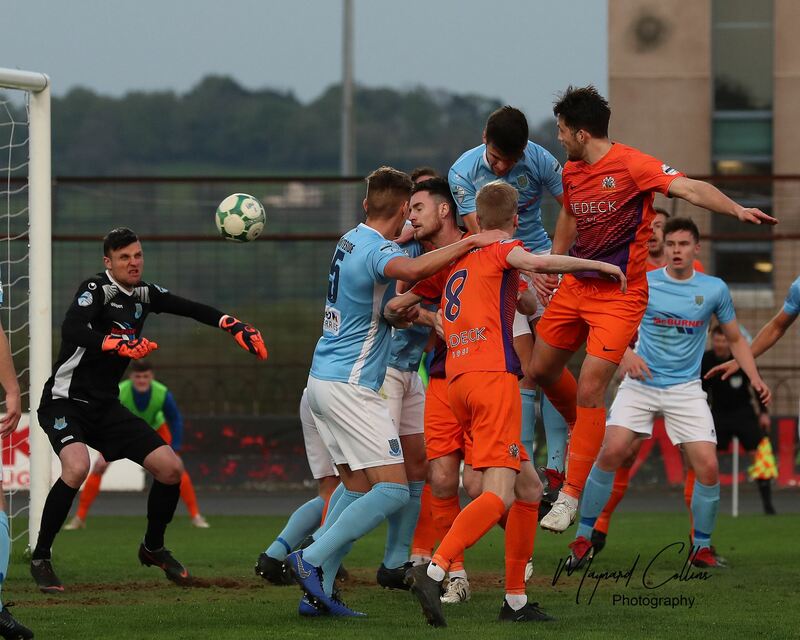 Up stepped Clingan, who calmly sent Doherty diving the wrong way as he slotted the ball inside the right-hand post to complete the comeback and send Mourneview Park into raptures. Sammy Clingan scores from the penalty spot to complete the comeback. Photo by Maynard Collins. 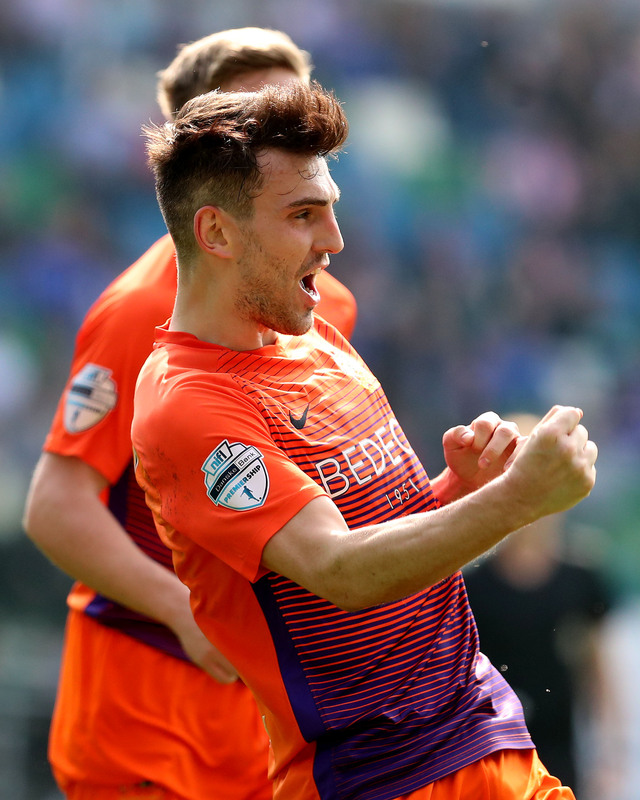 Glenavon’s victory means they are now just one point behind Crusaders and a further four behind Ballymena United in the race for the European places. The Lurgan Blues welcome Coleraine to Mourneview Park next Saturday (13th April) for the penultimate home game of the season (kick-off 3pm).